Taste test: These are just ordinary rippled potato chips, but they were quite tasty. They had a nice potato taste, not too much salt, and an average crunch. 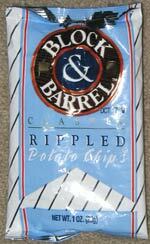 They closely resemble Wachusett ripple chips. Trivia: This bag was an extra, given in error as a replacement by a waiter after the first bag had been stashed away for donation to taquitos.net. This snack was discovered by Amitai at Greenhouse Cafe, Harvard Square, Cambridge, Massachusetts.